Top 5 Cards of ARGCS Chicago! You are here: Home / Top 5 Cards of ARGCS Chicago! Categories: Chicago, Featured YuGiOh! Articles, Free Articles, YuGiOh! Despite the dominance of Burning Abyss at ARGCS Chicago, there were still plenty of innovations that saw success throughout Day 1 and all the way through the top cut of Day 2! So today, I want to take a quick look back at the Top 5 cards from this past weekend! Denko Sekka was the marquis card from Jeff Jones and Marjanco Gorgievski's Chaos Shaddoll list. 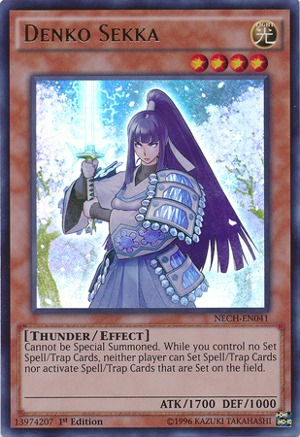 Capable of locking down backrow as soon as it hits the field (apart from being stopped by Solemn Warning), Denko Sekka gives you free reign to wreak havoc on your opponent and OTK your opponent. Multiple times we saw a Denko Sekka successfully hit the field only to have a player die that very same turn. El Shaddoll Fusion has been one of the hottest new cards from The New Challengers, and for good reason. The loss of Super Polymerization was a slight blow to the Shaddoll archetype, but El Shaddoll Fusion has stepped up nicely as a substitute. What makes the card so powerful is that you can use it during the Battle Phase, letting you fuse monsters that have already swung and get that last lethal swing in. 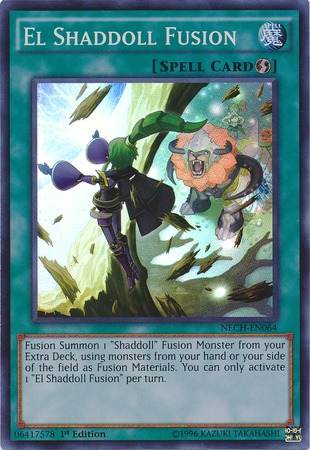 What's even better about the card is that once it resolves, if you used an El Shaddoll fusion monster for it, you can grab an El Shaddoll Fusion or Shaddoll Fusion right back to your hand! 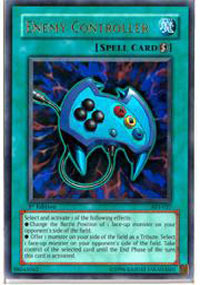 Look for this to be a staple for the Shaddoll archetype with at least two-three copies moving forward. Enemy Controller was a card not only highlighted in Jeff Jones' Chaos Shaddolls, but in the Side Decks of nearly every Burning Abyss player! A powerful card during combat to let you swing freely at your opponent's life points, or even just allow you to kill a tough defender like Dante, Traveler of the Burning Abyss or El Shaddoll Shekinaga. Enemy Controller shines in the Burning Abyss mirror match, letting you grab an opposing Dante to use it's effect then overlay for a Downerd Magician. The card has always been incredibly versatile; we saw its power during the reign of Plant Synchro way back in 2011 so its a breath of fresh air to see it wreaking havoc once again! We saw Night Beam rear its head in Qliphort decks at ARGCS Raleigh; Qliphorts want the enemy backrow free and Night Beam is a perfect weapon, especially against the chainable traps of Burning Abyss like Phoenix Wing Wind Blast and Karma Cut. 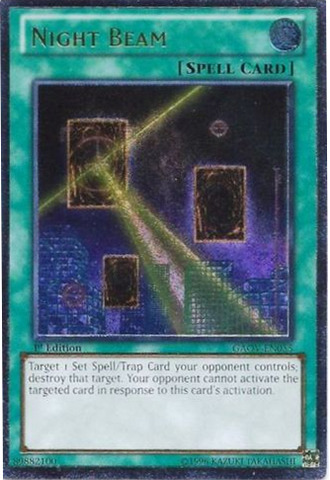 "Your opponent cannot activate the targeted card in response to this card's activation," is such a powerful clause, as it almost guarantees a successfull 1-for-1 exchange, or it forces your opponent to chain something else in response. We even saw Night Beam get slotted into the Main Deck of many of the Burning Abyss decks this past weekend, giving them the edge in the mirror match. What else can we say? Burning Abyss has been so dominant since the release of The New Challengers and a lot of that is due to just how much of a blowout this card can be. We saw Desmond Johnson cause Rob Cedar to scoop Turn 1 after a successful Fire Lake blew away all of Rob's back row. Not only is it a more versatile version of Icarus Attack (it's up to 3, not 3), but you can recur it from your graveyard thanks to the help of Dante. 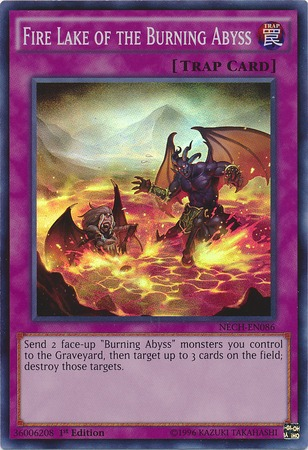 While much of Burning Abyss' success can be credited to the power of Rubic, Calcab, Alich, and Virgil, Fire Lake of the Burning Abyss is the "real" rock star of the deck! Remember, as always, Play Hard or Go Home! You don’t know me but I’ve read a lot of your stuff over the years. Good to see you writing somewhere again. I too am glad that E-con is seeing some love this format. I’m of the opinion that it’s always a good card. When I’m looking for a last thing to put in a deck, E-con is usually my pick. You’re playing a 36 card deck with 3 upstarts… You need one more really versatile card… Why not pick a card with 2 effects? Is that not the same as adding in 2 more cards in a way? And shot out to Evan Vargas for being the dude that first came up with my logic.